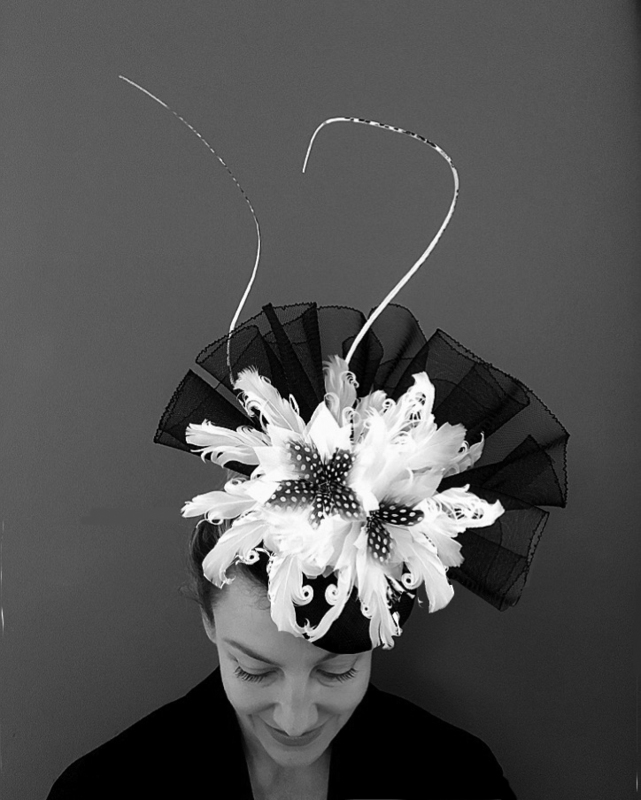 News and views about fascinators, headpieces and hats from Jemma Loveridge. Off the peg and bespoke. With the revised dress codes at Royal Ascot for headpieces and fascinators and with headpieces being very “in” at the moment there’s no time for a cup of coffee even …….. Either I am sewing my fascinators onto headpiece bases or am designing wonderful bespoke creations, which I just love. Just under two months to go until the Royal Ascot meeting and all the female racegoers are trying to finalise their outfits. This last week has been a week of shoes, handbags, dresses and of course the all important question “what to wear on my head”. I love making small conservative headpieces just as much as I love making the massive wayout creations – and I also love all the colour matching that has to go on to get to the final decision. All the woman I deal with are genius and the most important thing is that between us we get it right. So it’s back to the studio to meet my next two Royal Ascot clients who are due in for fittings, fashion, coffee and brownies this morning. It is time to dust off those beautiful spring outfits and team them up with elegant fascinators to ensure the look is sensational!! For a Spring wedding, a race meeting, a christening or even if you just fancy doing yoga in one – why not treat yourself. Everything about them is decadence – even the packaging. Handmade and lovingly sewn onto combs, headbands or discs they will ensure that any outfit is topped off perfectly. Kate Middleton wears them and the rest of the World love them – keep up to date and wow everyone. no longer permitted in the Royal Enclosure. So my thinking is that a base of 4 inches (10 cms) is easy to sew the fascinator onto – thus turning it into a headpiece. I can do it so hope is not lost! I can make discs of sinamay or straw and then sew the feathers onto the top and then sew the disc onto a headband which I cover in the same colour satin ribbon as the main body of the fascinator. that many ladies wear hats but this is not compulsory. How exciting to know that it is compulsory for fascinators to be worn at all times in the Grandstand Enclosure – I’m looking forward to a busy Spring and Summer after all. Here’s the link to the full information from Royal Ascot. THIS OFFER IS NOW CLOSED. SORRY. We are running an exclusive offer for our customers and any visitors to our website to get a special discount off all products at Kettlewell Colours. More details can be found on the right side of our home page. 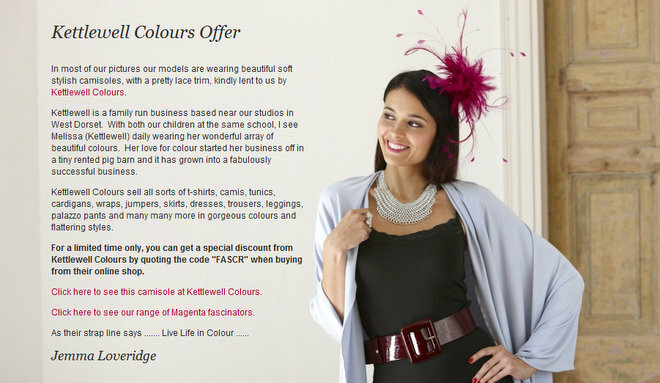 Kettlewell used one of our magenta coloured fascinators in their most recent catalogue shoot, so we thought we would get together and offer you something. The offer won’t last for ever, so go and discover it now! It is the Bridport Hat Festival this weekend so Andrea, who I make hats with, and I are investigating on Friday. There are numerous hat exhibitions in museums and children’s ‘how to make hats’ workshops etc. No doubt Bridport will be heaving with thousands wearing their favourite hats. I will certainly be wearing my new leopard skin trilby. I made it this morning. I keep making them and keep having them bought off my head, so here’s hoping I can keep hold of this one this coming weekend. As I was lying in bed on Friday morning with a glass of champagne, the tv was on and it was hat and fascinator spotting time. Would I see any of my fascinators boldly marching their way in to Westminster Abbey or not? The children and I checked out the fashions – what a parade of colours and style. Loved The Duchess of Cornwall’s hat – it is rather similar to a hat I am making for a celebrity for the first day of Royal Ascot. The Duchess always wears them well and never fails to please. Then I saw the lovely Duchess of Kent with her rose pink flower fascinator. Beautiful and simple. What a Spring treat Her Majesty The Queen looked in primrose – delightful and regal and who would believe that she has been married for 63 years – the first British Monarch to reach so many years. Well done Your Majesty. Loved her and Prince Philip’s arrival to the State Trumpeteers of the Household Cavalry – such pomp and ceremony. The Dean of Westminster looked magnificent in his gold cloak (made last year for the 450th anniversary of the Royal Charter of Westminster Abbey). He, alongside The Bishop of London and the ArchBishop of Canterbury looked a picture. I quite liked Theresa May’s hat – infact I thought she dressed rather well – but I was somewhat upset not to get a single glimpse of her face. Some hats can just be too big. Victoria Beckham looked rather uncomfortable next to her gorgeously relaxed husband – but then maybe that’s understandable with the imminent arrival of her little girl. Who spotted the diamonds on her wedding finger – or rather who didn’t – stunningly superb and sparkling!! Her fascinator was fascinating and she certainly stood out. I thought that Victoria and Tara Palmer-Tomkinson both looked great – good striking styles. Princesses Beatrice and Eugenie, if I’m allowed to say it, looked rather like the ugly sisters – please girls get a stylist and rather than accentuating your chests, wear dresses and jackets that kind of minimise. I wasn’t sure at all about Princess Beatrice’s antlers – preferred Eugenie’s creation and was rather sad that their Mother wasn’t there for some critic’ing. My favourite PM arrived with his lovely wife – Sam Cam – why oh why didn’t she wear a hat – bet her sister (deputy editor of Vogue) had words with her. Then, the cameras switched to Clarence House and the excitement was at such a peak that we had to decamp to the sitting room where the tv screen is much bigger. The gorgeous Princes emerged and my 5 and 6 year old girls went into a spin. The uniforms, medals, colours but most of all it is evident that my girls want to marry a Prince!! Oh hooray!! Now we are at The Goring Hotel – and the children and I really are – there was great talk of us arriving the day before and camping out to get a glimpse – the talk of the dress and all the pictures that the children are drawing are brilliant. What will her dress be like – this commoner who is soon to be a Duchess ……… and then she emerged – wow weeee. Beautiful, stunning, exquisite. I don’t suppose she could have worn a fascinator – but her Cartier tiara, loaned to her by Her Majesty certainly looked the part. Did the Middleton family really had to pay for all their rooms, including the £5,000 a night suite?? Surely the publicity they have, and will receive, is worth zillions!! Back to hats now and as Prince William and Prince Harry walked down the isle there was a rather eyecatching older woman in the back row wearing a rose flower – she looked rather lovely and well dressed – who she was I don’t know. Then we saw Princess Ann – she really looked lovely in her purples and greens and nets – well done her coz she got it right. Sophie, Countess of Wessex looked really fab – adored her fascinator – infact the children voted her fascinator the best. As Prince William and Kate were saying their vows it was rather unfortunate that the girl shown sitting between them in the distance was wearing a rather sad looking black sinamay circular fascinator. Bad family planning! Sitting behind the awesomely brilliant choristers was Ken Clarke and his wife, who I thought looked great. It was a simple plain fascinator but it suited her. Also in the back row behind the choristers was someone wearing a black and white tall hat with spots on the brim. She was wearing a white jacket – I wonder who she was – very eyecatching. Zara Phillips looked great – she was second best on our list – never keen on those saucer headpieces though because they fly off and Zara spent most of her time hanging on to it!!! All in all a magical day – love is definitely in the air. It’s really rewarding when customers of mine communicate and tell me what they think of my fascinators. And of course it gives a great sense of satisfaction when they tell me they like them. 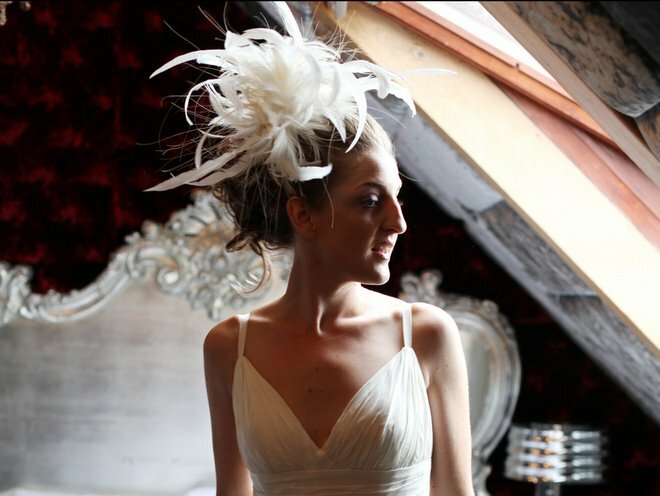 Carrie got married last year and ordered an Ivory Mayfair Fascinator from my website. I knew she liked it when she sent me an email after her hair trial. She said I could use a photograph here on the blog and I just think she looks just stunning.